Goodreads says, " With her trusty baton and six insanely organized clipboards, drum major Liza Sanders is about to take Destiny by storm—the boat, that is. When Liza discovered that her beloved band was losing funding, she found Destiny, a luxury cruise ship complete with pools, midnight chocolate buffets, and a $25,000 spring break talent show prize. Liza can’t imagine senior year without the band, and nothing will distract her from achieving victory. She’s therefore not interested when her old camp crush, Lenny, shows up on board, looking shockingly hipster-hot. And she’s especially not interested in Russ, the probably-as-dumb-as-he-is-cute prankster jock whose ex, Demi, happens be Liza’s ex–best friend and leader of the Athenas, a show choir that’s the band’s greatest competition. But it’s not going to be smooth sailing. After the Destiny breaks down, all of Liza’s best-laid plans start to go awry. Liza likes to think of herself as an expert at almost everything, but when it comes to love, she’s about to find herself lost at sea." Liza is a drum major for her school's marching band and she is privy to a secret about the fate of the band. If they don't raise a lot of money, the band will be cut due to the new school budget. So, they enter a contest on a cruise ship with the hopes of winning the grand prize. But things aren't smooth sailing aboard this cruise ship. Liza has to keep her eye out for ex-best friend, Demi, who is part of a dance team also vying for the grand prize and then she runs into Lenny, her childhood friend, who she has a crush on. To complicate matters further, there's also Russ, the super popular quarterback, who is helping the band out during this trip as punishment in order to make up for some wrongdoings. There's many hilarious moments that ensue, especially as Liza realizes who she has feelings for during this trip. Lauren Morrill's The Trouble with Destiny is a cute story that is perfect for younger YA readers who want something fun and light. Liza is a likable protagonist in The Trouble with Destiny. I liked that she was a bit of a geek and got herself into many hilarious situations. She is definitely a control freak, but once she gets aboard the ship, she realizes that it's going to be hard to control everything, especially her feelings for a particular boy. Plus, the setting of a cruise ship for a high school adventure is definitely a good time! Which leads me to the romance in The Trouble with Destiny....it was very light. If you are looking for something stronger, look elsewhere. The romance in this novel is definitely for younger YA readers and is reminiscent of something on the Disney Channel or even an episode of Glee. 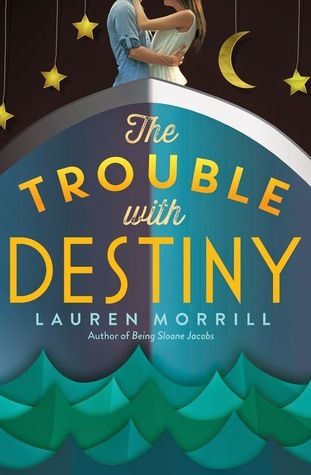 The Trouble with Destiny is a quick read that's perfect for readers looking for something light and sweet. I enjoyed the overall message that you can find love in unexpected places. Hm. I think I'm going to want more from the romance Christina! I like my romances with some quality kissing at the very least, and it sounds like this might not give me that. Still, it seems like a really cute read, and I love that it's set on a cruise ship! Yeah, I definitely did, but I went into it thinking this book would be perfect for 8th/9th graders, so it worked for me in that sense. The setting of a cruise ship was definitely my favorite part. Thanks for visiting, Jenny! It seems that we have pretty similar feelings on this book. I really liked the humor of it all, and the cruise setting was one of my favorite parts. And I agree, it is very Disney-esque. I think you liked Liza a bit more than I did. You're right, this is a light read, meant for younger YA readers, but it was not one of my favorite Morrill books. Yes, the humor and the cruise ship setting were a lot of fun. I'm glad you agree that it's very Disney-esque. I am sure many 8th/9th graders will enjoy this. I liked Liza in the sense that she was a quirky/band geek, but her anxieties did take a toll on me. I have never read any of Morrill's novels, so I should probably check out her other ones, because I hear they are better. Thanks for visiting! This sounds kind of fun. I just picked up a copy for the library and hopefully our teens will enjoy it. I think younger teens will enjoy it. It's fluffy, light, and easy to read. Thanks for visiting, Christina! Very Disney for sure. Probably a good book for when I need something light...and campy. Lol. Definitely. You have to be in the mood for something light....also geared toward a younger YA audience for sure. Thanks for visiting, Joy!